On April 3, I-T officials conducted a raid on the house of Telugu Desam Party (TDP) leader and Tirumala Tirupati Devasthanam (TTD) Trust board Chairman Putta Sudhakar Yadav in Proddatur in Kadapa district. 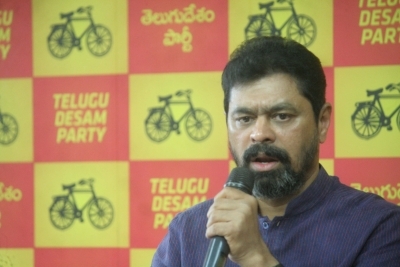 Sudhakar Yadav was also the TDP candidate from Mydukur Assembly constituency in the same district. Sudhakar Yadav, who is also the Chairman of PSK Infrastructure and Projects Limited, later said the IT officials left after a five-hour search without making any seizure. I-T officials also searched TDP's Rajya Sabha member C.M. Ramesh's house in Kadapa district on April 5. Ramesh, a close aide of TDP President and Chief Minister N. Chandrababu Naidu, said the IT sleuths found nothing in his house. Ramesh, whose businesses were also raided a few months ago, alleged that the BJP was behind the raids to help the YSR Congress Party. On April 9, two days before Lok Sabha and Assembly elections in the state, I-T officials conducted a raid at the residence of Gurappa Naidu, the cost accountant of TDP leader Galla Jayadev, who is seeking re-election from the Guntur Lok Sabha constituency. The I-T Department later said it conducted the search at the residence of Gurappa Naidu after information was received on a toll-free number that cash was kept at his residence which was to be used for the elections. They seized Rs 45.4 lakh from the premises. The I-T Department said that it was only while recording his statement that Gurappa Naidu revealed that he was giving services to Jayadev. Jayadev, who was the richest MP in the outgoing Lok Sabha with declared assets of Rs 683 crore, is the director of Amara Raja Group, known for its automotive battery brand Amaron. The I-T officials also conducted searches at the residence of YSR Congress Party candidate from Guntur Lok Sabha constituency, Modugula Venugopala Reddy. Condemning the raids on TDP leaders, Chandrababu Naidu had staged a sit-in during the election campaign, slamming the Narendra Modi-led government at the Centre for misusing I-T and other central agencies to target TDP leaders. A day before the polling, he also staged a sit-in in front of the Chief Electoral Officer's (CEO) office in Amaravati over the I-T raids and transfer of state officials by the Election Commission. Naidu questioned the I-T raids at a time when the model code of conduct was in force. During a visit to the DMK headquarters in Chennai on Tuesday, Naidu said the searches were only targeted against those who were opposed to the Bharatiya Janata Party (BJP).